November 5, 2018, 8:00 AM · News from Italy this past week was devastating. Floods wreaked havoc on communities in Sicily and storms struck the Alto Adige region in the north. Along with terrible tales of human loss, the BBC reported that winds reaching 200 kilometers per hour felled more than 300,000 trees in the Val di Fiemme, the world-renowned Violin Forest. A heritage site, the forest protected resonance firs, the prized raw materials for tone wood. Documentary evidence embellished by legend tells of Antonio Stradivari’s trips from Cremona to the Paneveggio forest to search for the perfect raw materials for his instruments. The present-day tragedy was made all the more poignant as the traditional date for cutting these trees (usually between late October and early November) had been pushed back due to inclement weather. Experts noted that it would take more than two centuries to replace the legendary forest. With the tone wood supply severely depleted, the question as to how instrument makers and instrumentalists will react is a pressing one. Will we become more open-minded toward instruments made from composite materials? Can lessons learned from the vanguard bow makers inspire a re-thinking process? Archetiers, better known as bow makers have experimented with composite materials ranging from carbon fiber to graphite for decades. The threats to Brazil’s pernambuco supply, the wood that has produced the most extraordinary bows, have increased in the past few years as deforestation to promote ‘easy cash’ crops has all but destroyed the pau-brasil or pernambuco trees that gave the country its name. Although pernambuco scarcity has not led to extra on-the-ground protection, it takes pride of place in a treaty, the Convention on International Trade in Endangered Species which makes export of the commodity all the more difficult. Awarded a MacArthur ‘genius’ grant in 2012, Rolland has indeed pushed further. His patented Galliane™ frog is uniquely set up to place bow hair at an ergonomic angle matching wrist movement. In 2017, moving on beyond the bow, Rolland turned his creativity to design a conductor’s baton. Amongst my pride possessions all these years is a first generation Rolland Spiccato® a carbon fiber bow. Its deep burgundy color still attracts attention on and off stage. Although the unique internal mechanism that adjusts the bow’s camber has ceased to work after 15 years of constant use, the bow is still remarkable in terms of both the sound it pulls and the comfort level it affords the user. But what of Michael Duff and his progress these last two decades? The opportunity to ‘test drive’ a recent Berg Bow Tourte-Voirin model was all the more opportune while mulling over the recent devastation in Italy. A biochemist by training and musician by passion, Michael Duff, the present-day driving force behind Berg Bows, is passionate about his craft. Hand molding each bow in the old tradition of bow making brings Duff close to the source of his craft. Life-long experimentation with materials led to Duff’s most recent additions to a prodigious line of developments. One of his most recent advances in design modification led to the search for new materials for the frog of the bow. Spearheaded by a search for new, eco-friendly materials, Duff investigated the properties of Blackwood and has of late opened the door to the use of more eco friendly woods including stabilized burled rosewood and cocobolo. The process is simple in description but complicated in execution. While the Blackwood frog looks and feels like wood, it is, as Duff explains, a stabilized form of the wood. This stabilized form further translates into durability as the possibility to crack or chip the frog a common phenomenon with traditional ebony frogs is minimized. The proof is of course not in the pudding but in the playing. Testing one of Michael Duff’s Tourte-Voirin violin bows mounted with an African Blackwood frog provided a sizable group of professional orchestral and chamber music musicians with a rare treat. (To get an idea of the price range, on Berg's website these are priced at $7,500.) To make the test all the more authentic, the violinists were not told that the bow they were testing was made of composite materials. The responses were incredibly enthusiastic as each individual placed a bet as to who the real archetier could have been. Not one violinist guessed that the bow was a composite bow; all assumed it was within the Tourte-Voirin range of rare bows. Players commented on the strength and excellent balance that stimulates the production of a flexible, rich tone from frog to tip. Not only varied sound projection but also elasticity was another plus point noted by the group eager to take the bow out for a test run in concert halls around town. The entire group was amazed by the ‘ability to draw a bigger sound’ as well as perceived velocity and the bow’s ability to bounce easily and pull a pianissimo sound. Weighing in at 61 grams, this particular model, based on experiment’s with original old French bows, did not feel ‘heavy’ to several of the violinists who are accustomed to play with lighter bows. Duff would have been pleased to discover that his experiment based on the concept of the bow as “a continuous sound loop—comprising stick, frog and bow hair’ and his theory in which extracting natural resins and water from wood samples would net a higher velocity rang true in practice. To the violinists, sonority may have been even more important than the tested velocity. Somber musings on the aftereffects of natural and ecological disasters have been mitigated at least in terms of the future of composite materials in bow making. The world of sound that has opened with Berg Bow’s Tourte-Voirin model in its African Blackwood frog form shows that the future is bright for string players who can rely on conscientious innovation. November 5, 2018 at 08:26 PM · Would love to get some pricing information, these bows sound absolutely great as opposed to some of the lower end what we used to call carbon fiber bows! Thanks so much for the update. November 5, 2018 at 09:13 PM · Thanks for sharing, seems like the bows have come a long way. Where can I get ahold of theses bows and is Rolland still making composites? November 6, 2018 at 04:19 PM · Please send me an email and I will respond to any questions you may ask. November 6, 2018 at 10:36 PM · I personally don't understand why so many composite bows (low end and high end) are aimed at the same weight as pernambuco (61 grams) when they can be much lighter. There's no magic to 61 grams being a perfect weight -- it just happens to be the average weight for pernambuco, so it requires the least adjustment by players used to wood bows. Arcus's original model (now the S series) is a hollow construction and only 47 grams, and for myself and a number of people I know, that weight is a revelation. At first it feels so light it would float away if you let go. But once you get to know it, you can accomplish all the same action as a heavier wood bow but with much faster response and a much lighter grip. If we're going to use new materials, rather than just trying to duplicate wood performance, why not take advantage and make them better? Maybe someday there will be high-quality carbon composite fiddles with acoustical characteristics that greatly surpass spruce and maple but with greater durability. 1) While the devastation of forest in Italy is heartbreaking, high quality maple and spruce is in plentiful supply around the world. The only limit on the number of excellent violins is the number of people with the knowhow to make them. 2) It seems odd to focus on Rolland (who no longer makes bows) and Berg (which is very high end and small scale) and not mention Arcus, which does very high quality plastic bows in a large workship that can produce as many as people will buy. And I haven't tried the mass-produced carbon bows of JohnPaul and Codabow lately, but I suspect their upper level models are closer than they've ever been to being able to support the requirements of highly accomplished players. November 6, 2018 at 10:45 PM · Carbon fiber bows just don't have the same beautiful sound as the present bows. I have tried and tried to befriend them, but they just don't have the same beautiful sound as the bows that I have grown up with. The old bows are so warm and natural in comparison. 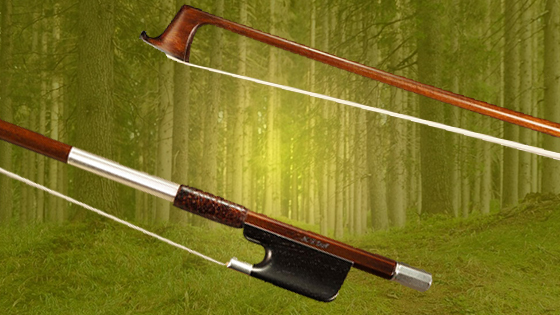 My first impression was carbon fiber bows are like Walmart compared to Amati. November 7, 2018 at 08:49 AM · Keep trying!! There are considerable differences between the high-end composites and the happy student bows! I custom make all my bows. I can vary flexural strength, weight, and balance. Most are made to order. In addition I keep a few in stock, and while I usually make them around 61 grams I can make violin bows in the range 57 grams to 63 grams. but he no longer makes the carbon fiber SPICCATO bow, concentrating now on Pernambuco bows. You mention Arcus bows. They are very low end, not considered performance bows on account of their sound. Berg bows are NOT carbon fiber and have been, from their introduction, very high quality being played by artists like Jaime Laredo, Arnold Steinhart and the late Ruggerio Ricci for example. My latest patented frogs produce a superior (more resonant and pure) because the wood conducts sound at a higher velocity than natural wood which is porous. I agree with you about the sound of carbon fiber bows. Berg bows are not carbon fiber.They are crafted from a proprietary combination, and they look and sound like pernambuco bows. The great violinist Fraco Gulli ( nicknamed the Italian Heifets) said Berg bows have a very healthy focused sound on my Stradivarius. Today I supply them with my stabilized hardwood frogs which give them more resonance (more power) and a purer (more focussed ) sound. Don,t give up hope. Test one of my Tourte-Voirin model violin bows.